February is the month of that certain Saint's day we either love or hate. Since soul music so often deals with matters of the heart, we figured a soul night is the best way to celebrate. 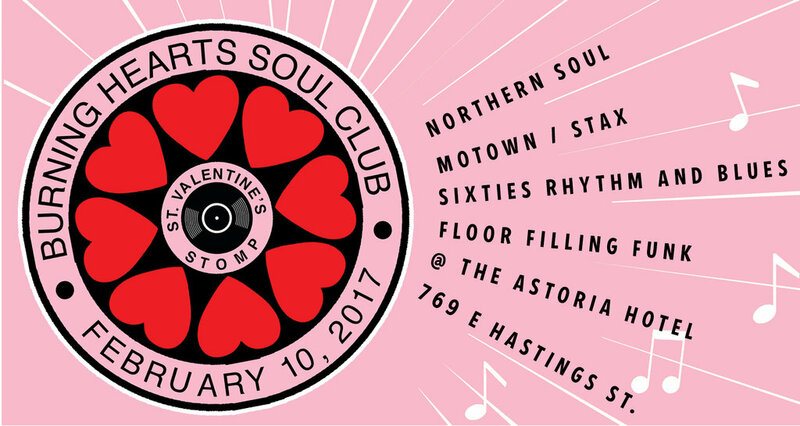 So we are happy to announce that Burning Hearts Soul Club will present the Saint Valentine's Stomp on Friday February 10th @ The Astoria. This night is for every one, so come check it out and join the dedicated dancers and soul lovers that have become a hallmark of the BHSC soul nights. The dance floor is always packed and the music is always stellar. So whether you are celebrating Valentine's day or not, The St. Valentine's Stomp will be THE soul dance party to attend in February. Expect to hear resident DJs Keith McCafferty & Dave Mac play selections from down and dirty early 60s R&B to hard hitting 70s funk to the Motown/Stax classics you know and love to that northern soul beat that is perfect for moving your feet. Of course, at BHSC these tunes are always heard the way God intended; off of all original vinyl @ 45 RPM and we GUARANTEE you will hear new and different tunes each month. So come on down to the Astoria on Friday, February 10th and dance and sing along to classic tracks you know and love and surely you will leave having danced to some new favourites as well.